On Friday I met a bunch of friends at a park somewhere down south, near the Plaza. The specific meetup time was "eightish," so I hopped on the bus at a little after seven, and got off at 43rd. I had plenty of time, so I decided to walk past the Kansas City Art Institute, as I had never actually seen it before in nine years of living in Kansas City. It was very small but very cool looking. The evening was like what you see in old paintings of people in gigantic clothes: women in dresses made of an acre of silk, and men in three-piece suits sporting chained monocles and top hats. In short, it was perfect outside. The vivid blue of the sky contrasted brilliantly between the full summer leaves of Rockhill and Southmoreland, and a breeze carried the scent of flowers to me from their beds to the conjectural west. Not so much walking as floating, I wandered into the park and back a a couple minutes after eight. My feet impacted the overgrown lawn of the park as reality set back in, and I made my way the long way around the fence that had been erected around the event. In 2003, I went to Berkeley Riverfront Park with my brother and my friend Stacey for the Tour de Fat, a bike-centered beer event put on by New Belgium Brewing and well attended by all. Dogs and bikes abounded, and a great time was had by all. I watched year after year, and they never came back to do it again. The closest the event ever was to KC when it was held again was St. Louis. On Friday New Belgium made their eventual return to KC, after over seven years away, for the "Clips of Faith," film festival. A small collection of short, usually humorous, often moving films were shown after the sun went down. Many of them made sure to carefully position New Belgium's products for everyone to see, but even so it was very fun. The sky was clear, the crickets were crackling, and the beer was delicious. I could hardly have thought of a more entertaining use of my Friday night. When the films were over though, the crowd dispersed like cockroaches when a light turns on. We went over to Fred P Ott's on the Plaza for a beer, and went home. I woke up the next day far too early for how late I went to bed, and communicated poorly with Nick over IM or text about getting lunch at Burger to Go. It's an absolutely amazing burger place at 7th and Central in KCK that used to be a Checkers or a Rally's, or something like that. I wound up going by myself, but I regret nothing about going there. The food is so good that I have to remind myself to chew it. I met Jeff for a drink at the Peanut shortly after that. The 3rd was his birthday, and I didn't want to miss it. At around 7pm or so I rolled over to Grand Slam and picked up a six of Single Wide, clutching my bag of undetonated fireworks from perhaps 2005. Nick and Anna had a cookout at their house, and everyone made themselves at home while we were there. At around 10pm or so, I got the itch to head home. Nick taught me better of it, and I wound up staying for an additional six hours before I left at bird-chirping time. Before that though, we played charades, some kind of drinking jenga game, and wrought various levels of destruction in blowing up the remainder of my fireworks. The last of these were blown up well after midnight. They either have some extremely patient neighbors, or nobody was home, nearby. Either way, no protest was given to our mayhem. I slept until noon on Sunday the 4th. I would have slept more if convention had allowed. After sitting for a while weakly sipping water to counteract a hangover that had begun the previous day, I received a message from Nick, inviting me to get some food at Sharp's. I arrived unshowered to find an unshowered ensemble of Nick, Anna, and Daniel tucking into eggs benedict and biscuits and gravy. I ordered some honey mustard fried chicken sliders and drank four full glasses of water before the check came. It was a successful meal on all fronts. We decided we wanted to keep it moving, so we dropped Daniel off at work, and Nick showed us around his childhood neighborhood, and pointed out no fewer than seven times the school where he served his K-8. As we slowly, creepily rolled around Western Hills and Santa Fe Hills, both Nick and Anna pointed at houses with 87-, 88-, and 89- addresses, and stated the names of people they knew while growing up. Locals! In response to their familiarity with south KC, as compared to my lack thereof, I spirited them to Raytown. We followed the detour around the missing bridge for 63rd St to the Bickering Tree, a relatively trashy bar that uses hanging helmets of various type and style as over-table lamps. I sponsored a pitcher of Budweiser and we made ourselves as comfortable as we could with the bar's outspoken clientele. We moved on after our pitcher to Highway 40, or as they call it in KC, "40-highway," where we called at the Bamboo Hut. None of us had ever been there before. We sat outside in their pretty filthy patio. We got a pitcher of Busch and Anna laughed uncontrollably as the bartender poured it all over my legs by accident. The kitchen was closed, as they were cooking out. They had a large gas grill that they were still using fluid to light. With a sharp WOOF the grill leaped to life, scorching the TV mounted right above it with 4-foot tall flames. We had no choice but to buy a plate of food. We had some bratwurst and potato chips, and some baked beans, potato salad, and pasta salad that came from large plastic tubs for $5 a plate. Anna refused to eat any of it, and I can't say I particularly blame her. The bar seemed to have a bit of a pest problem, judging by the abundance of pests. That said, we had a great time at the Bamboo Hut in Independence, and would happily go again and recommend it to anyone. Just be ready for some grit. We made haste from there to Nick and Anna's house, where I dropped them off. I hurried home and took a 60-90 second shower, rendering myself 3-8 minutes late for a drink at the Peanut. Sunday night went on apace, and I met up again with Nick and Anna for a rooftop party in the West Bottoms. Nathan joined us as well. After the evening of watching fireworks in every direction was over, Nathan and I went over to 1st St by the railroad crossing in the East Bottoms, lit off perhaps two hundred individual pyrotechnic items. I introduced Nathan to the "sparkler ignition technique," in which a sparkler is laid on the pavement, and a dozen or more bottle rockets are laid along it. The result is a rapid-fire succession of bottle rocket launches and explosions. We scored several direct hits on passing trains, and lauded them with cheers and fists in the air. I dropped Nathan off at his sister's place in the River Market, and went promptly to bed. I got up the next morning, and went to El Camino Real #2 with Nathan. That was the entire extent of what I did yesterday. I sat at home, played video games, and drank lots of water. It was a banner weekend. Having now worked out in the world for several years, I've come to an understanding about something. 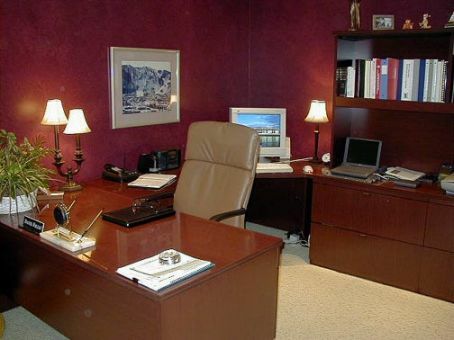 If you work in a cubicle, It doesn't seem to matter how comfortable or "Class-A" it is. The intent in its design is clear: subordination. You are in a cubicle, and you therefore are beneath someone else. Your role is to be "under" someone else. This fact has been made clear to me by the structure and layout of the cubicle. Allow me to elaborate. Take this old picture, for example. 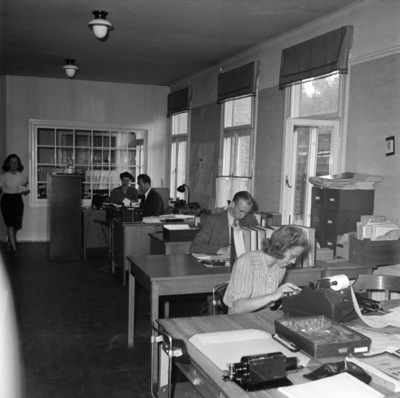 This is an average shared office-like workplace from probably about 60 years ago. Look at all the people. They're all pretty visible from throughout the room, but even without partition walls between them, they each have a modicum of privacy. Look at how their tables and desks are all perpendicular to the wall, and not flush against it. Their backs are to nothing in particular. If someone comes to talk with one of them, they only need to look up. They don't need to turn around. Compare that to the average cubicle of today. The partition separates and isolates the occupant from coworkers. The only privacy the occupant is afforded is from his/her contemporaries. If anyone approaches the cubicle, the occupant's back is to them, which means that while the occupant is working, all they do is visible for any passerby, but especially to management. The occupant knows that their boss can see whatever it is that they're doing, just by approaching the cubicle. This means that the overarching motif is fear. The design goal is for occupants to be productive not for the sake of productivity, but for fear of getting in trouble. To further reinforce the intent behind modern office design, let's have a look at a typical managerial office. The door to this room is off to the left, or possibly the right, but certainly in such a position that the occupant of the office can see who's there, and face them with a piece of authoritative furniture between themselves and the visitor. The theme of the manager's office is comfort and authority, as opposed to the theme of the cubicle, which is vulnerability and fear. 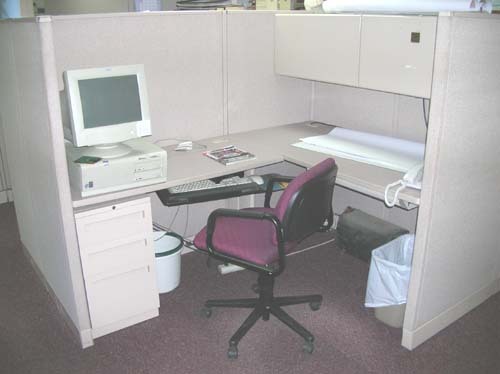 I've worked in many cubicles over the years, and they've all been similar enough to the one pictured above that the main points I stressed were consistent. When I worked at Sprint, I remember that I didn't like what I was doing on my computer to be visible to anyone who came close. So I moved my computer to a part of the desk that allowed me to face the entrance of my cubicle. This way, my computer screen faced only me, and I could see when people visited me. My boss, Barbara, was very opposed to this idea, and cited this rearrangement in a write-up she composed after I'd been there a short time. She didn't like that she couldn't see what I was doing on my computer. She didn't like that she couldn't surprise me anymore. She was very accusatory in her tone. "What are you trying to hide?" she would ask. "It's very paranoid that you would do this." The simple truth at the time was that I didn't like people tapping my shoulder without me knowing they were there, but thinking back I realize that I felt like a subject of management, and not like a valued employee. Every manager I've ever had has had an office with a desk that allowed them to face the door. In addition, they would always put their computer in a position to allow them to see who was coming at all times. Nobody ever claimed that the people in management were paranoid, or trying to hide anything. Such ideas didn't enter people's minds. Indeed I'm sure they were looking at youtube and facebook too, just like everyone else. But they had no need to worry about whether anyone could see it. So why does a cubicle dweller not only work in fear of reprisal, owing to the default layout of their allotted work space, but the manager is above reproach? Don't even take into account things like managerial incompetence or hypocrisy, or whatever other charges you can levy against any manager you've ever had. Look past all of that and ask yourself, why don't we ever wonder what they're looking at on their computer? We certainly worry about them seeing what we're doing. Why does the term, "time theft" only seem to apply to cubicle-dwellers? Even the dwellers themselves don't generally think about what their managers are doing, if it doesn't relate directly to what they themselves are doing. We have an office layout system now that encourages discipline with fear, and work ethic through paranoia. It seems like a problem to me.